Floyd Clifton Wooley, News, Sports, Weather! SEC Gifts! : Journal Entry 111613-A: What a Week! Journal Entry 111613-A: What a Week! Monday was Veterans Day and I salute the Veterans and their families. Supposedly we got some kind of fix for Obama Care like anybody but a Philadelphia Lawyer could figure out anything that comes out of Washinhton D.C. anyway. Typhoon Haiyan pounded the Philippines and no one really knows if it was stronger than Katrina or not because they don't have the hurricane hunters to fly into the storms like we do here in The United States of America. I on the other hand had a bumper crop of Satsuma's on my two tree's. I took some to my daughter's family and we had an unexpected but welcome opportunity to have supper together. My Son's family got a few as well and to top it off I got the opportunity to see my youngest son in Fairhope this morning on the way to the Pier with Boo Boo. I got to the doctor to this week as mentioned in an earlier post about my back problems that I have but I still don't know how many month's it will take to determine if my insurance will help pay for the epidurals the doctor want's to do- if I can afford them even then or if they will even help if I have the dad-gum things done. Battleship Marine is open and I plan on finishing this year pretty strong and having a good year next year! That is if we don't get hit with a rock from Space we don't see first for what-ever reason for God sakes! Lol. 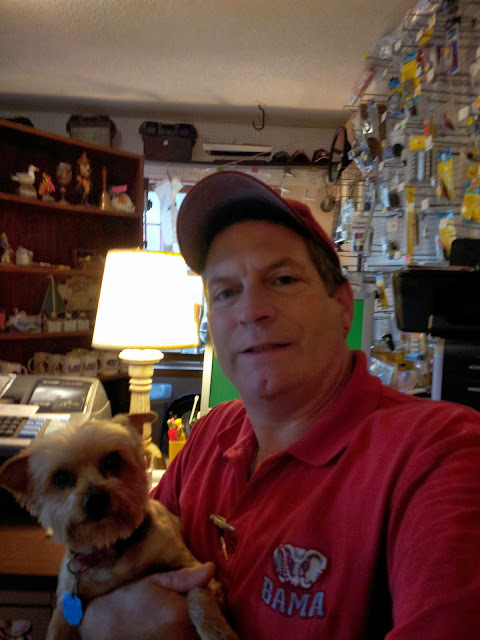 Stop by and see me and Boo Boo if you need anything for your boat, boat trailer or Marine Engine or give me a call at 1-251-367-4111 and let me quote you a price on the Parts and Accessories you need for your boat, boat trailer or marine engine! I would love to have your business.